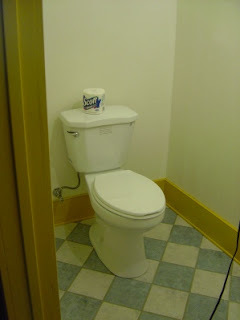 The little bathroom is coming along: Plastered, sink working, toilet working, all that's left is connecting all the electrical (oh Mike where art thou). 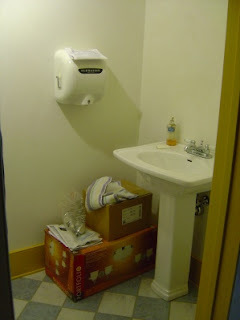 In below picture the big white box on the wall is called an XLerator, a hand dryer, which dries your hands within 15 seconds (through high velocity and heat). They cost a pretty penny, but they save paper (and for a restaurant owner everything that goes with it: buying paper towels, providing a trash can for the paper towels, having to empty the trash can for the paper towels, having to refill the paper towel dispenser, cursing at whoever tried to flush the paper towel down the toilet, well you get the idea) and money.